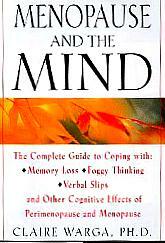 Menopause And The Mind -- Memory Loss? Foggy Thinking? Verbal Confusion? How Hormones Affect The Brain! With CLAIRE L. WARGA, PH.D.
You are receiving this newsletter because you subscribed via the message boards, or our mail sign-up page. If you no longer wish to receive ourmailings, please click on the "Manage Your Subscription" link at the bottom of this E.Mail. No, You're Not Losing Your Mind! How Hormones Affect The Brain! Claire L. Warga, Ph.D.Neuropsychologist, researcher, author of the much-discussed New Yorkmagazine article "Estrogen and the Brain," is the author of thegroundbreaking book, MenopauseAnd The Mind: The Complete Guide to Coping with the Cognitive Effectsof Perimenopause and Menopause Including Memory Loss, Foggy ThinkingAnd Verbal Slips. Are you between the ages of 35 and 60 and having trouble remembering yourbest friend's phone number? If this sounds familiar to you, take heart:Claire Warga's help and advice are on the way. Dr. Warga identifies the"mind misconnect" syndrome that causes unsettling events during perimenopause and menopause, noting that they are not signs of imminent madness but a natural part of aging. She names this condition "WHMS:Warga's Hormonal Misconnection Syndrome." Drawing upon cutting-edge brain research and many never-before-described cases, Warga provides the first scientific explanation for why the symptoms occur and reveal show they can be reversed or alleviated. She provides a self-assessment test to help readers determine whether they are experiencing "mind misconnect" syndrome and offers important information and advice on estrogen replacement therapy as well as non-hormonal treatments that mimic estrogen's mind-boosting effects. Her self-screening test,symptom chart, and treatment measurement technique are important tools every woman can use to assess her condition and progress over time,with or without her ob/gyn. FIVE FREE COPIES of Menopause And The Mind will be given away at the chat. Join Dr. Claire Warga, Dec. 8th at 9:15 PM, ET, in Power Surge Live! Mrs.Malaprop: a character in Richard Brinsley Sheridan's 1775 play TheRivals. "A...woman of almost fifty [emphasis added] who...is famous formisusing...long words that sound similar to the correct words." -- Larousse Dictionary of Literary Characters Malapropisms: the type of verbal errors made by the character Mrs. Malaprop. There are some topics almost no one talks about till you do first. The stampede for the male impotence drug Viagra unveiled one such topic. This book is about another one: the previously unrecognized cognitive symptoms that are caused by the effects of perimenopause and menopauseon the mind. Why have I called this set of symptoms a syndrome? Because the set of symptoms occur frequently in association with each other, as a constellation, or sets of subconstellations. Certainly not all women who have some of the symptoms have all of the symptoms, but sufficient cumulative experience interviewing women has persuaded me that the symptoms represent a possible set that are part of the same causative agent. Till now in the relatively few instances when popular writers have referred to the above symptoms they have usually used seemingly mild, and nonspecific terms such as "concentration problems," or "forgetfulness,"or "memory problems" to refer to women's experiences during these years, without an appreciation of the range of possible "glitches" in speech, behavior, and cognition that women in actuality have been experiencing. Broad-spectrum terms such as "forgetfulness" or"concentration problems," in effect, "wallpapered" or plastered over the variety and the bizarreness of the symptoms women have encountered. The casual, familiar terms masked or obscured the specific reasons why otherwise seemingly normal and healthy women might be inclined to say such phrases as "I think I'm losing it" or "I think I'm flipping out"or "I think I'm cracking up." KatherineKennedy (alias) is a thirty-eight-year-old professor of English at an Eastern university who also hosts a weekly talk-radio show. She is married to a scholar, has no children yet, but hopes to have them in the future. WhenI was younger I had the most retentive memory for everything, especially names and faces. Friends in college would say, "Your mind is like a Rolodex." When I entered my thirties I started having the sestrange symptoms. I would meet people and the next day felt as though I had never seen them before. They'd know me but I had no due as to who they were. Their faces were just not registering. It so happens that I had begun to menstruate copiously around that time, more than before but I did nothing about it. Not recognizing faces still happens. I find that slightly scary because my grandmother was demented; and I sometimes wonder if it's hitting me very early. Katherine Kennedy's case is an example of pure WHM cognitive/speech/behavioral symptoms occurring at a rather early age -- what I think of as a"one-ring circus" of symptoms -- with no body symptoms (i.e., hotflashes or vaginal dryness) or associated mood/emotional symptoms except for her diminished sense of self in reaction to having the symptoms. Her symptoms can't be said to be occurring in reaction to sleeplessness, or hot flash disruptions, or depression because she doesnot report these. Like many women her age she isn't thinking about hormone changes in relation to these symptoms, but her mention of greater bleeding in her early thirties when her WHM symptoms appeared to her to begin, likely reflects the increased variability of periods (more, less, longer, shorter) that typically characterizes perimenopause. I view her case as being linked to hormone changes because, as you will see with later cases, it echoes in its pattern of specific symptoms so many of the other women whose symptoms did beginin association with hot flashes or vaginal dryness -- indicators of hormonal changes. Like many women Katherine Kennedy has not seen a doctor about these symptoms. She has been coping with them in multiple ways. As with many women the symptoms are occurring within the contextof a fully lived functional life. They are mainly invisible to others though very noticeable to her. When this began I had no idea this could even be related to hormonal changes. I learned this from the experience of my friends. I thought menopause was about going through hot flashes. I didn't associate hormonal changes with what I was experiencing. I didn't have any mood swings during this time the way some women do. In fact I was the calmest, most unflappable I'd ever been. Things I had feared doing before I could do now, like driving at night. But my memory was a mess. I'd write things down and forget where I'd put the list. Ithought about going to a doctor but I'm not one to go running to them very readily. I thought maybe I was pre-Alzheimer's but then I said tomyself, "No one in my family has ever had it." I did stop using my deodorant, however, because I had read that something in deodorant --aluminum -- caused Alzheimer's. I also stopped using aluminum foil and switched to shrink-wrap for that reason. Like many perimenopausal or menopausal women with erratic memory who take hormones, Sherry's symptoms led her to sometimes forget to take medications consistently (although in her case, ambivalence due tofears of cancer related to her family history may partially account as well for her forgetting). Product manufacturers need be mindful of memory as a basis for noncompliance with prescribed and nonprescribed treatments. The morals: (1) You can't know the interior experience of the woman sitting next to you by knowing your own. (2) You shouldn't be intolerant of women whose experiences in this regard differ from your own. (3)You can't characterize the experiences of all women by knowing the individual experiences of some women. Some women first experience WHMS symptoms in their thirties, some in their sixties. Some never do. The existence of many distinct biological subgroups of women means in terms of research on perimenopausal and menopausal women that very large-sizesamples are needed to get accurate findings that detect accurately whatis true in nature about women. Small-size sample studies may obscure and find insignificant what may be very true in nature. What this means in terms of treatments for perimenopausal and menopausal women is that possibly very different forms or intensities of treatment may be needed to help women with different biological natures. Copyright©1999 by Claire Warga, Ph.D.
Read the transcript With Susan Rako, M.D. Whyput your body through the rigors of adjusting to the"one-size-fits-all" HRT when naturally compounded, bio-identicalhormones can be tailor-made to your body's needs? If you haven't already done so, why not check out our extensive Educate Your Body area. There you will be able to read articles on midlife issues, as well as answers to commonly asked questions.